What makes the Munson typewriter so appealing is its naked display of mechanics. Designer Samuel John Seifried of Chicago, shows his pride in his design by making the movement of each rod and each spring visible to the operator. 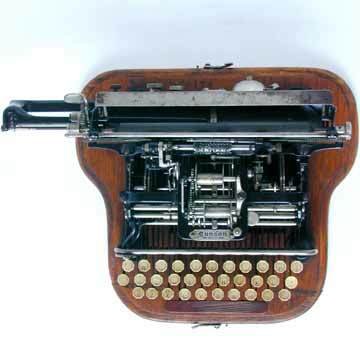 The Munson was to live on in a more modestly covered version as teh Munson 2 and then, from 1898 on, as the Chicago, which under the cover was an identical machine with a horizontal typesleeve that was hit from behind by a hammer.